Please use this online form to report any non-league games. All teams are allowed a total of four exhibition games during the season. Teams are responsible for scheduling and paying for officials for any non-league games. Use this FORM for requesting an official. 1. Assign staff to monitor local weather conditions before and during events. 2. Develop an evacuation plan, including identification of appropriate nearby shelters. play and take shelter immediately. reset the clock and another 30 minute count should begin. Then Click the “Team” tab, to see Standings, etc. 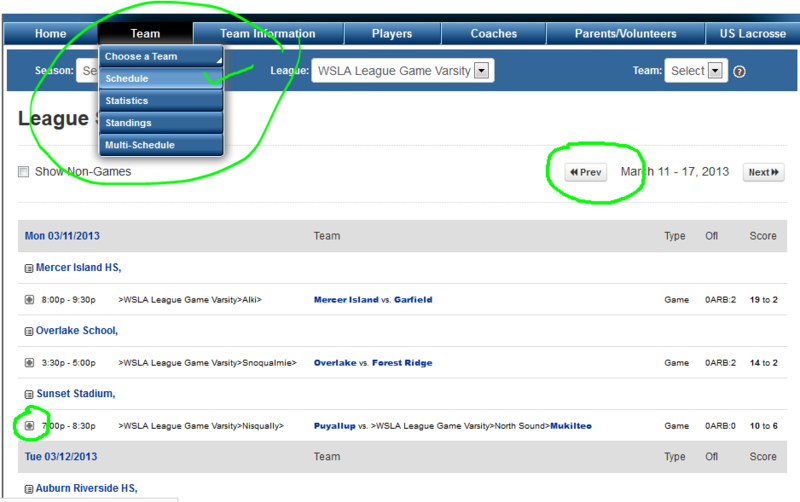 Click “Schedule” to view All Games Played and their Score! at left of time click on sign for Game Details! On the Stats page: Click any column name to sort by that column's data. If starting a new team please consider writing for a Grant to help with gear, both US Lacrosse and the Washington Chapter offer Grants.